Imagine, if you can, a tough-talking, law-and-order-obsessed French Interior Minister sprinting around an ornate office in hot pursuit of a small dog chasing a large bunny as visiting U.S. dignitaries gaze on. Now picture France's no-nonsense President Nicolas Sarkozy as that official zipping around before diplomatic VIPs. The world has WikiLeaks to thank for that image. That August 2005 scene  described by then-U.S. Ambassador Craig R. Stapleton as charming rather than risible  was one of many revealing details in diplomatic cables released by WikiLeaks on Tuesday. The memos both praise and critique Sarkozy's personality and leadership, describing him as "viscerally pro-American" and "particularly well-suited to lead France," but also as a "thin-skinned, authoritarian" man prone to making "impulsive proposals" whose foreseeable flaws frequently create problems for him. Sarkozy, the cables say, is "brilliant", "charming, innovative" and "arguably the most influential leader in Europe," yet one who has brow-beaten advisors to the point that they won't challenge him on clearly questionable decisions  and who has left the public feeling he inhabits a presidential bubble of "monarch-like impunity." "Sarkozy's own advisors demonstrate little independence and appear to have little effect on curbing the hyperactive president, even when he is at his most mercurial," writes current U.S. Ambassador Charles H. Rivkin in a cable dated Dec. 4, 2009. To show just how far Sarkozy's staff will go to keep him from being displeased, Rivkin recounts the April 2009 state visit of Turkish Prime Minister Recep Tayyip Erdogan  for which Paris' mayor had lit up the Eiffel Tower in the colors of the Turkish flag. Knowing that Sarkozy was due to fly into Paris and aware of his resolute opposition to Turkey's wishes to the European Union, Rivkin writes, timorous Elysée staffers "reported re-routing the President's plane to avoid his seeing the Eiffel Tower lit up in Turkey's colors." That isn't the only cable that casts Sarkozy as counter-productively willful  and even petty. In a May 19, 2008 memo, Stapleton notes how the French media had taken to dubbing Sarkozy the "bling-bling president" whose admiration for the rich and famous disgusted many voters and set off his continuing free fall in popularity polls. "In a major miscalculation in image management, Sarkozy paraded for media coverage his billIonaire-lifestyle affair with former supermodel and current First Lady Carla Bruni-Tedeschi, whom he married within weeks of meeting her following his divorce from his second wife, Cecelia (sic) Sarkozy," Stapleton writes. "The media [started portraying] Sarkozy as a vulgar, insecure celebrity-worshipper focused only on himself and his place in the limelight." Still, the ambassadors' criticism of Sarkozy is more than offset by praise of a leader described as "the most pro-American French president since World War II," and one who "sees his own rise in the world as reflecting an American-like saga". In the August 2005 cable, Stapleton depicts the then-Interior Minister  two years away from becoming president  as regretting the damage caused by the split between France and the U.S. over Iraq. Though Sarkozy says he would have advised the U.S. against invading Iraq, he is said to blame what Stapleton characterizes as "unjustifiable and excessive reaction" by the President at the time, Jacques Chirac, and his staff for the damage done to Franco-U.S. ties. During those same talks with Stapleton, Sarkozy also boasts of how his own identification with U.S. values and society earned him the nickname "Sarkozy the American"  an honorific that, given the date of the encounter, indicates Sarkozy bestowed it upon himself. 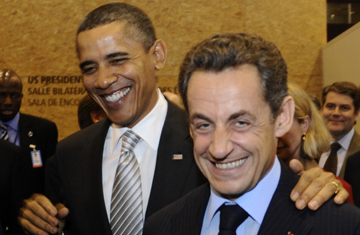 But there was good reason for Sarkozy's wanting his U.S. visitors to view him as a solid ally and partner: he confirmed to them that he'd be seeking the presidency in 2007  a plan he only let French voters in on 16 months later. Shortly following that announcement, Sarkozy winds up chasing his family's pet dog and rabbit around his office after his young son Louis has brought them in to meet the ambassador. According to Stapleton, it was "an unforgettable scene" that "filled the room with gleeful laughter." No one, of course, is laughing in the wake of the WikiLeaks revelations, though it's unlikely the cables mean trouble between Paris and Washington  or any other capitals. "These leaks merely show diplomats saying things we all knew were being said behind closed doors anyway," says Philippe Moreau Defarges, a foreign-policy specialist with the French Institute on International Relations. "People in power and the public will quickly forget what's being revealed  but [officials] won't forget they'll have to find a way to prevent future leaks." Which means the world may never find out what kind of house pets Sarkozy is chasing around the Elysée these days. See TIME's interview with Julian Assange about secrecy, China and WikiLeaks' growth. See why Assange wants Hillary Clinton to resign.